Celtic mythology is the mythology of Celtic polytheism, the religion of the Iron Age Celts. Like other Iron Age Europeans, the early Celts maintained a polytheistic mythology and religious structure. For Celts in close contact with Ancient Rome, such as the Gauls and Celtiberians, their mythology did not survive the Roman Empire, their subsequent conversion to Christianity and the loss of their Celtic languages. It is mostly through contemporary Roman and Christian sources that their mythology has been preserved. The Celtic peoples who maintained either political or linguistic identities (such as the Gaels in Ireland and Scotland, the Welsh in Wales, and the Celtic Britons of southern Great Britain and Brittany) left vestigial remnants of their ancestral mythologies that were put into written form during the Middle Ages. Although the Celtic world at its height covered much of western and central Europe, it was not politically unified nor was there any substantial central source of cultural influence or homogeneity; as a result, there was a great deal of variation in local practices of Celtic religion (although certain motifs, for example the god Lugh, appear to have diffused throughout the Celtic world). Inscriptions of more than three hundred deities, often equated with their Roman counterparts, have survived, but of these most appear to have been genii locorum, local or tribal gods, and few were widely worshiped. However, from what has survived of Celtic mythology, it is possible to discern commonalities which hint at a more unified pantheon than is often given credit. The nature and functions of these ancient gods can be deduced from their names, the location of their inscriptions, their iconography, the Roman gods they are equated with, and similar figures from later bodies of Celtic mythology. As a result of the scarcity of surviving materials bearing written Gaulish, it is surmised that the most of the Celtic writings were destroyed by the Romans, although a written form of Gaulish using Greek, Latin and North Italic alphabets was used (as evidenced by votive items bearing inscriptions in Gaulish and the Coligny calendar). Julius Caesar attests to the literacy of the Gauls, but also wrote that their priests, the druids, were forbidden to use writing to record certain verses of religious significance (Caesar, Commentarii de Bello Gallico 6.14) while also noting that the Helvetii had a written census (Caesar, De Bello Gallico 1.29). Rome introduced a more widespread habit of public inscriptions, and broke the power of the druids in the areas it conquered; in fact, most inscriptions to deities discovered in Gaul (modern France and Northern Italy), Britain and other formerly (or presently) Celtic-speaking areas post-date the Roman conquest. Although early Gaels in Ireland and parts of modern Wales used the Ogham script to record short inscriptions (largely personal names), more sophisticated literacy was not introduced to Celtic areas that had not been conquered by Rome until the advent of Christianity. Indeed, many Gaelic myths were first recorded by Christian monks, albeit without most of their original religious meanings. The oldest body of myths stemming from the Heroic Age is found only from the early medieval period of Ireland. As Christianity began to take over, the gods and goddesses were slowly eliminated as such from the culture. What has survived includes material dealing with the Tuatha Dé Danann and the Fomorians, which forms the basis for the text Cath Maige Tuired "The Battle of Mag Tuireadh", as well as portions of the history-focused Lebor Gabála Érenn ("The Book of Invasions"). The Tuatha Dé represent the functions of human society such as kingship, crafts and war, while the Fomorians represent chaos and wild nature. The leader of the gods for the Irish pantheon appears to have been the Dagda. The Dagda was the figure on which male humans and other gods were based because he embodied ideal Irish traits. Celtic gods were also considered to be a clan due to their lack of specialization and unknown origins. The particular character of the Dagda was as a figure of burlesque lampoonery in Irish mythology, and some authors even conclude that he was trusted to be benevolent enough to tolerate jokes at his own expense. Irish tales depict the Dagda as a figure of power, armed with a club. In Dorset there is a famous outline of an ithyphallic giant known as the Cerne Abbas Giant with a club cut into the chalky soil. While this was probably produced in relatively modern times (English Civil War era), it was long thought to be a representation of the Dagda. This has been called into question by recent studies which show that there may have been a representation of what looks like a large drapery hanging from the horizontal arm of the figure, leading to suspicion that this figure actually represents Hercules (Heracles), with the skin of the Nemean lion over his arm and carrying the club he used to kill it. 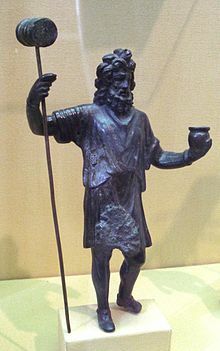 In Gaul, it is speculated that the Dagda is associated with Sucellus, the striker, equipped with a hammer and cup. The Morrígan was a tripartite battle goddess of the Celts of Ancient Ireland. She was known as the Morrígan, but the different sections she was divided into were also referred to as Nemain, Macha, and Badb (among other, less common names), with each representing different aspects of combat. She is most commonly known for her involvement in the Táin Bó Cúailnge. The god appearing most frequently in the tales is Lugh. He is evidently a residual of the earlier, more widespread god Lugus, whose diffusion in Celtic religion is apparent from the number of place names in which his name appears, occurring across the Celtic world. The most famous of these are the cities of Lugdunum (the modern French city of Lyon), Lugdunum Batavorum (Brittenburg, 10 kilometers west of Leiden in the Netherlands) and Lucus Augusti (Greek: Λοuκος Λuγούστον, the modern Galician city of Lugo). Lug is described in the Celtic myths as the last to be added to the list of deities. In Ireland a festival called the Lughnasadh (Irish: Lúnasa "August") was held in his honor. Other important goddesses include Brigid (or Brigit), the Dagda's daughter; Aibell, Áine, Macha, and the sovereign goddess, Ériu. Notable is Epona, the horse goddess, celebrated with horse races at the summer festival. Significant Irish gods include Nuada Airgetlám, the first king of the Tuatha Dé Danann; Goibniu, the smith and brewer; Dian Cecht, the patron of healing; and the sea god Manannán mac Lir. Less is known about the pre-Christian mythologies of Britain than those of Ireland. Important reflexes of British mythology appear in the Four Branches of the Mabinogi, especially in the names of several characters, such as Rhiannon, Teyrnon, and Brân the Blessed (Bendigeidfran, "Bran [Crow] the Blessed"). 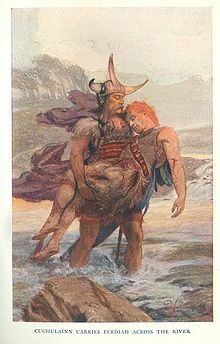 Other characters, in all likelihood, derive from mythological sources, and various episodes, such as the appearance of Arawn, a king of the Otherworld seeking the aid of a mortal in his own feuds, and the tale of the hero who cannot be killed except under seemingly contradictory circumstances, can be traced throughout Indo-European myth and legend. The children of Llŷr ("Sea" = Irish Ler) in the Second and Third Branches, and the children of Dôn (Danu in Irish and earlier Indo-European tradition) in the Fourth Branch are major figures, but the tales themselves are not primary mythology. 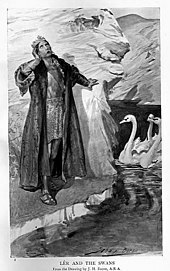 While further mythological names and references appear elsewhere in Welsh narrative and tradition, especially in the tale of Culhwch and Olwen, where we find, for example, Mabon ap Modron ("Divine Son of the Divine Mother"), and in the collected Welsh Triads, not enough is known of the British mythological background to reconstruct either a narrative of creation or a coherent pantheon of British deities. Indeed, though there is much in common with Irish myth, there may have been no unified British mythological tradition per se. Whatever its ultimate origins, the surviving material has been put to good use in the service of literary masterpieces that address the cultural concerns of Wales in the early and later Middle Ages. The Celts also worshiped a number of deities of which little more is known than their names. Classical writers preserve a few fragments of legends or myths that may possibly be Celtic. According to the Syrian rhetorician Lucian, Ogmios was supposed to lead a band of men chained by their ears to his tongue as a symbol of the strength of his eloquence. The first-century Roman poet Lucan mentions the gods Taranis, Teutates and Esus, but there is little Celtic evidence that these were important deities. A number of objets d'art, coins, and altars may depict scenes from lost myths, such as the representations of Tarvos Trigaranus or of an equestrian ‘Jupiter’ surmounting the Anguiped (a snake-legged human-like figure). The Gundestrup cauldron has been also interpreted mythically. Along with dedications giving us god names, there are also deity representations to which no name has yet been attached. Among these are images of a three-headed or three-faced god, a squatting god, a god with a snake, a god with a wheel, and a horseman with a kneeling giant. Some of these images can be found in Late Bronze Age peat bogs in Britain, indicating the symbols were both pre-Roman and widely spread across Celtic culture. The distribution of some of the images has been mapped and shows a pattern of central concentration of an image along with a wide scatter indicating these images were most likely attached to specific tribes and were distributed from some central point of tribal concentration outward along lines of trade. The image of the three-headed god has a central concentration among the Belgae, between the Oise, Marne and Moselle rivers. The horseman with kneeling giant is centered on either side of the Rhine. These examples seem to indicate regional preferences of a common image stock. The classic entry about the Celtic gods of Gaul is the section in Julius Caesar's Commentarii de Bello Gallico (52–51 BC; The Gallic War). In this he names the five principal gods worshiped in Gaul (according to the practice of his time, he gives the names of the closest equivalent Roman gods) and describes their roles. Mercury was the most venerated of all the deities and numerous representations of him were to be discovered. Mercury was seen as the originator of all the arts (and is often taken to refer to Lugus for this reason), the supporter of adventurers and of traders, and the mightiest power concerning trade and profit. Next the Gauls revered Apollo, Mars, Jupiter, and Minerva. Among these divinities the Celts are described as holding roughly equal views as did other populations: Apollo dispels sickness, Minerva encourages skills, Jupiter governs the skies, and Mars influences warfare. In addition to these five, he mentions that the Gauls traced their ancestry to Dīs Pater. MacBain argues that Apollo corresponds to Irish Lugh, Mercury to Manannan mac Lir, Jupiter to Dagda, Mars to Net, and Minerva to Brigit. ^ Cunliffe, Barry, (1997) The Ancient Celts. Oxford, Oxford University Press ISBN 0-19-815010-5, pp. 183 (religion), 202, 204–8. ^ O'Rahilly, T. F. (1984) [1946, 1964, 1971]. Early Irish History and Mythology. Dublin: Dublin Institute for Advanced Studies. ISBN 0-901282-29-4. ^ Ross, Anne (1972). Everyday Life of the Pagan Celts. Carousel Books. pp. 166–167. ISBN 0-552-54021-8. ^ Chadwick, Nora Kershaw (1970). The Celts. Penguin Books. p. 149. ISBN 978-0-14-021211-2. ^ Ross, Anne (1972). Everyday Life of the Pagan Celts. Carousel Books. pp. 168–170. ISBN 0-552-54021-8. ^ Jackson, Kenneth Hurlstone (1971). A Celtic Miscellany. Penguin Classics. pp. 27–28. ISBN 0-14-044-247-2. ^ Geddes & Grosset Ltd (1997). Dictionary of the Celts. Brockhampton Press London. p. 41. ISBN 1-86019-709-4. ^ Geddes & Grosset Ltd (1997). Dictionary of the Celts. Brockhampton Press London. p. 130. ISBN 1-86019-709-4. ^ Paul-Marie Duval. 1993. Les dieux de la Gaule. Éditions Payot, Paris. ISBN 2-228-88621-1. pp. 94–98. ^ G.S. Olmsted. "The Gundestrup version of Táin Bó Cuailnge". Antiquity, vol. 50, pp. 95–103. ^ a b Powell, T.G.E. The Celts. Thames & Hudson, London. 1958. ^ Chadwick, Nora. The Celts. Pelican Books. 1970. ^ Ross, Anne (1972). Everyday Life of the Pagan Celts. Carousel Books. p. 208. ISBN 0-552-54021-8. ^ MacBain, Alexander (1976). Celtic Mythology and Religion. Folcroft Library Editions. pp. 69–75. ISBN 0-8414-6043-4.
de Vries, Jan, Keltische Religion (1961). Wikimedia Commons has media related to Celtic deities.